Have you ever wanted to try your hand at pottery? The thrill of throwing down clay onto the potter’s wheel, using your hands to create your own pot… perhaps not quite knowing what the final result will be – but that’s the excitement of the art; every ceramic pot can be different! Pottery has been with us for thousands of years, being used by humans throughout the ages to store and carry food and drink from the earliest times. Pottery has perhaps enjoyed a renaissance in recent years and even had its’ own BBC television programme broadcast both this year and last, as potters competed with each other to be crowned in the Great Pottery Throw Down. Here in the South East, Grayshott Pottery in Hindhead, Surrey has been making pottery for more than 60 years – and today it is a successful business producing ceramic giftware for shops and galleries throughout the UK. If you’re looking for that special gift, then Grayshott has an extensive “Emporium” of all kinds of pottery, whether you are treating yourself to a new dinner set, a hand-painted plate, a mug or some beautiful jewellery. 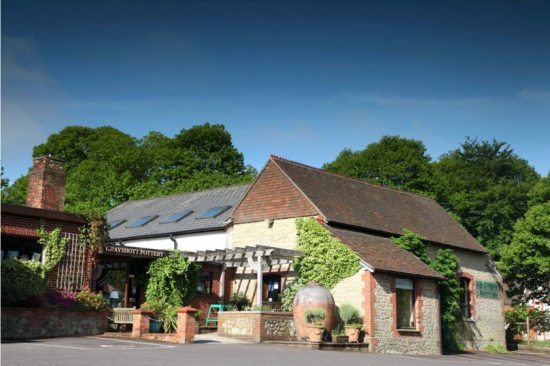 However, Grayshott Pottery is more than a shop: you can try your hand at pottery, too! I remember first having a go at pottery when I was at school, recalling how quickly you could use simple ingredients of water and clay, aided by the speed of the potter’s wheel, to craft your own pot. Mine wasn’t especially successful – but I guess that is part of the fun. Grayshott run their own workshops for both children and adults where you are able to spend a day or a few hours having a go at this interesting art form. To find out more about the Pottery Workshops and Events click onto their website; there are upcoming events over Easter and in May and June and the price includes one piece of pottery that has been glazed and fired. If you’d like to discover more about how pottery is made, then you can take part in free ‘Journey of the Clay’ tours which are held twice daily; please note that booking is essential. These tours are a great way of discovering how the talented Grayshott artists transform their clay into stunning creations using techniques from the past as well as using modern, contemporary methods. 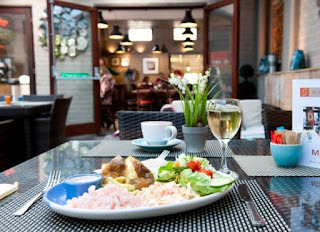 And after all that pottering about, you can relax and perhaps discuss the merits of your creations with a tasty snack or lunch at the Grayshott Pottery Kiln Café. 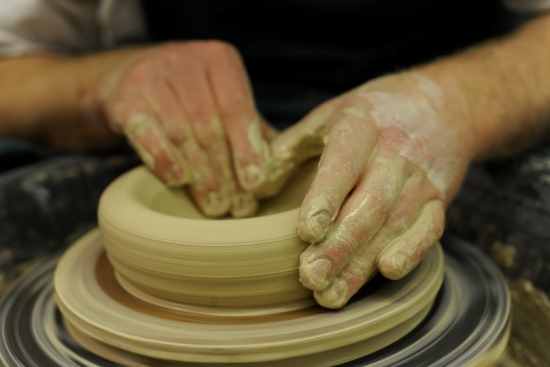 Go on – Why not have a go, you never know there may be a budding potter just waiting to come out? By Simon Frost at Hibou Communication. See here for all of Simon's previous blog posts. Tractor Ted Arrives at Stonor Park!